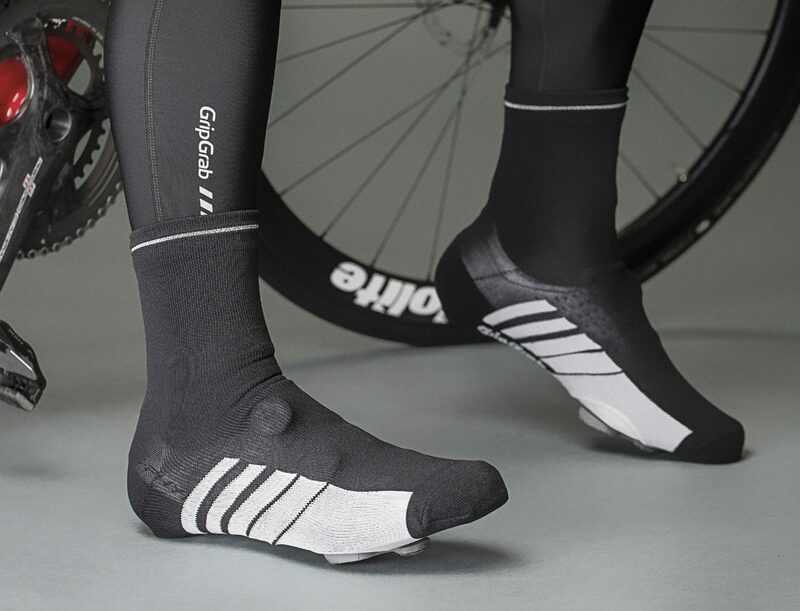 Cycling Overshoes – Which Shoe Covers do you need for What type of Weather? Cycling overshoes can make riding your bike in autumn and winter a lot more pleasant. From thin, waterproof shoe covers to thick, thermal overshoes, we’ve got them all. 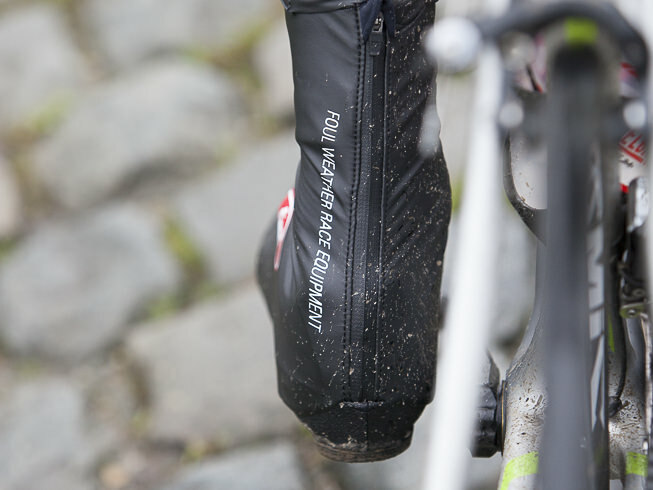 So what to look out for when purchasing cycling overshoes? What size shoe covers should you get, for example? And just how waterproof are shoe covers really? Most cyclists use overshoes to protect from the cold, rain, and wind. Because if there’s anything that feels uncomfortable on the bike, it’s having to cycle with cold or wet feet. When choosing the right shoe covers, you’ll have to consider how windproof, waterproof, and naturally how warm they are. It all starts with picking the right size covers however. Picking the right size shoe covers isn’t always easy though. A good general rule would be to pick at least 1 size up from your regular shoe size. Windproof, waterproof, and aerodynamic as well? The right overshoes can do it all. The exact size varies from brand to brand and depends on whether you’ll be wearing road cycling shoes or mountain bike shoes underneath.. In doubt? You can always talk to our customer service for advice! Cycling overshoes come in a number of varieties. From extremely warm to lightweight and highly aerodynamic. What best suits your needs is something only you know best. Many shoe covers can be worn over both MTB shoes and road cycling shoes. MTB overshoes have a more rugged layer, often made from kevlar, underneath the cycling shoe though. MTB overshoes often have a reinforced nose and heel. This means you can walk on them if you have to without having to worry about breaking them. With these, you can easily walk up those last few meters of that particularly tricky climb. Road cycling overshoes are often a little more delicate and therefore less suitable to walk in. Everyone experiences cold differently, not to mention the differences in the many cycling shoes out there. 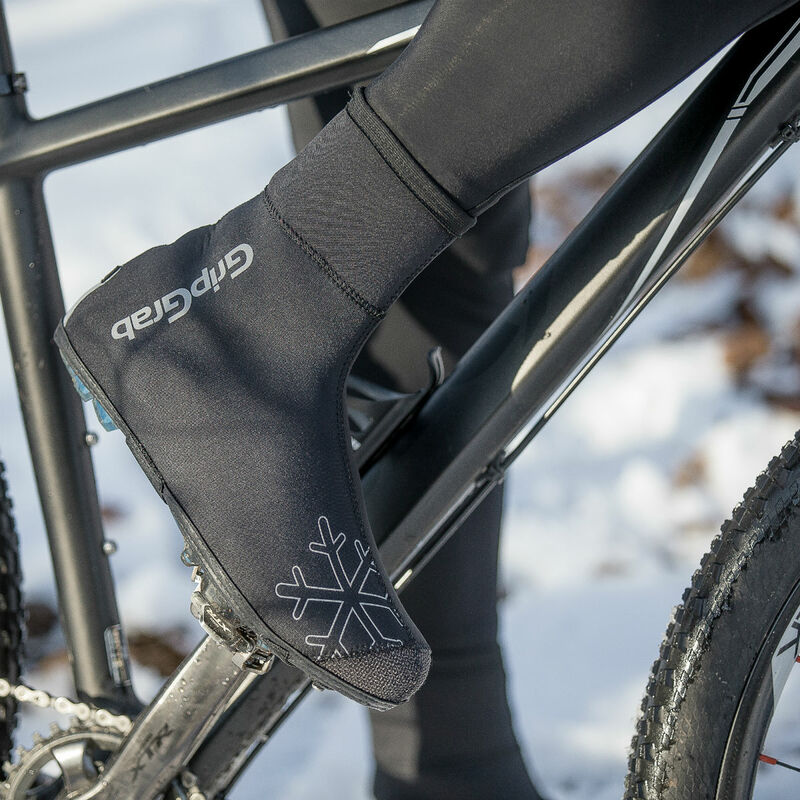 We start with the advantages of warm overshoes for winter cycling. It’ll come as no surprise that the warmest overshoes are all waterproof as well. Because if anything can cause cold feet, it’s water. The outside is often made from stretchable neoprene, sometimes with an additional water-repellent top layer. With the right clothing, including overshoes, you can effortlessly take to the road -or woods- in the heart of winter. The advantage of neoprene is that it stretches and has decent waterproof properties. In order to make them even warmer, fleece or textured fleece is often added to the inside. This layer of fleece traps a thin layer of air which, once warmed up, acts as an extra insulating layer. Overshoes for the worst cold are often made of neoprene. A striking new winter shoe cover is the GripGrab Arctic X. It doesn’t have a zipper, making it fit more snugly around the top. The tighter the fit at the top, the less rain can run down into the shoes. You have to put these overshoes on before you put your cycling shoes on. Autumn might be the hardest season to properly dress yourself for when you’re heading out on the bike. The same applies to your overshoes. You don’t want cold or wet feet, but overheated feet are equally uncomfortable. Waterproof overshoes are often enough in autumn. Winter overshoes can be too warm, causing your feet to overheat. Fortunately you have a choice in overshoes which are slightly less hot than the real winter overshoes. They can still be waterproof and windproof if you so desire. In this category you’ll find overshoes like the Castelli Evo, which are more breathable and slightly less waterproof. That is, particularly on changeable days where the sun does its best to shine on occasion, a lot more comfortable. Besides all those overshoes for cold and poor conditions, there are plenty of overshoes available for a bit more day-to-day comfort. These overshoes are often nice and thin, but still capable of withstanding a cold breeze and light shower. All you have to manage is the wind when you’re cycling in relatively nice conditions. These shoe covers are particularly comfortable in reasonably fair conditions, but when there’s also still a chance of mild showers. The wind in particular can cool your feet considerably on days like these. 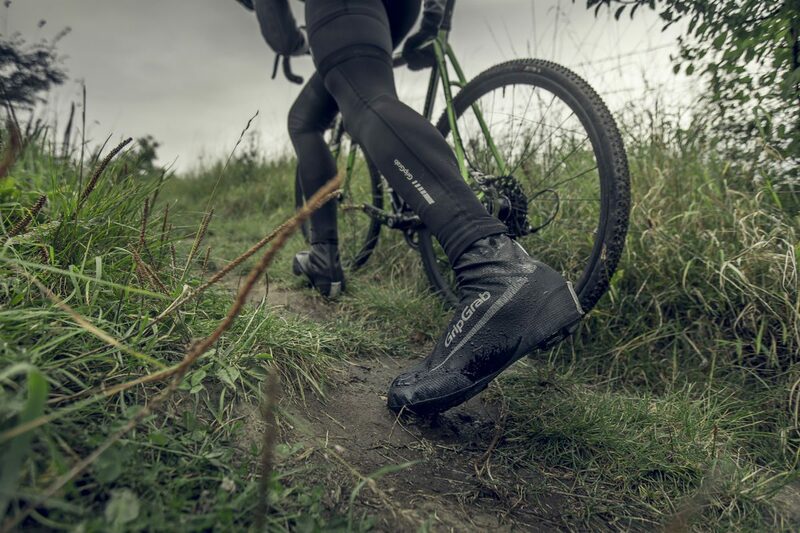 The thinner overshoes can just about keep out the wind, allowing your feet to remain warm and comfortable. Again, you could opt for overshoes more aimed at offering waterproof performance. These shoe covers would be considerably less breathable while still being able to withstand a considerable shower with ease. Looking for an aerodynamic overshoe? Then you’ll usually have to give up a little warmth and waterproofing. This type of overshoe was designed with lightness in mind. Frequent cyclist? You could opt for a set of aerodynamic overshoes, and go for hi-vis while you’re at it. Added visibility at night is always a bonus! These overshoes also fit tightly around your cycling shoes to hide any protruding elements on the shoes as aerodynamically as possible. Their increased vulnerability is a downside though. So if you frequently throw your equipment around, you’re probably better off going for a slightly more sturdy shoe cover. Waterproof overshoes, but still have wet feet? Finally you have to realise that, while many shoe covers are waterproof, water can still find its way in particularly by running down your legs and into your shoes. 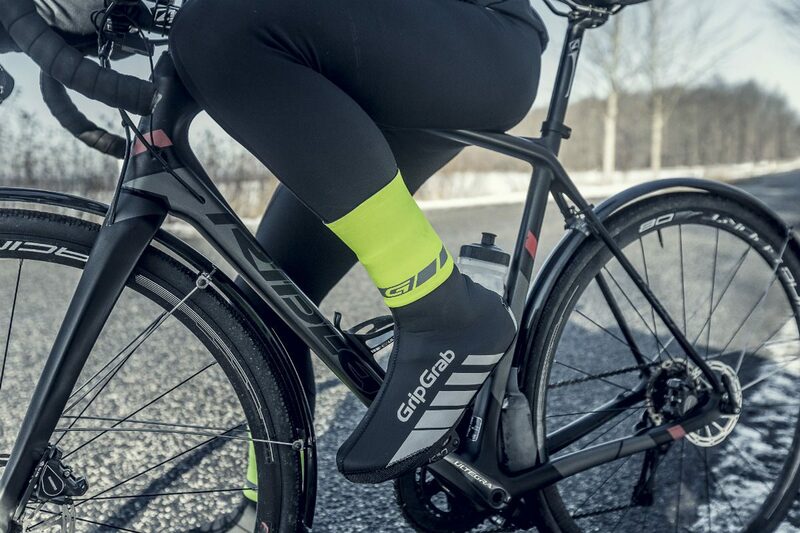 The CyclingGaiter by GripGrab closes off the gap between your leg and shoe covers. Rain will then no longer be able to run down into your shoes. This means you’ll still be getting wet feet. A waterproof overshoe is virtually always waterproof then, but not capable of preventing water from running down into the shoes. GripGrab has added the CyclingGaiter to their line-up this year. It closes off the gap between your leg and the upper part of your shoe cover. This prevents water from finding its way down, keeping your feet dry for longer. You can find me on a bicycle almost every day. I commute just over 50 km each day to and from my house to Mantel HQ. Often on my road bike, and during the winter on an old crosser. And if that isn't enough, you can find me on my bike during most weekends too. On my trusty road bike or my mountainbike. And the most awesome thing of all? As a content creator and reviewer I regularly get to ride with the newest gadgets to write reviews for Mantel... And if you can't find me outdoors riding my bike, odds are I might be riding on Zwift. And to think I can call all that riding 'work'!